Despite a couple of quirks with its input devices, and a low screen resolution, the 15.6in Acer Aspire V7 is a very interesting laptop that caught us a little by surprise. It's solid, good looking, performs well, and its battery life is long. Acer's Aspire V7 is a big unit with a thin profile and solid build quality. With a 15.6in form factor, it's a little strange to see a laptop so thin take up such a big footprint on a desk, but it's definitely a cool unit that offers an interesting overall computing experience, including touch. Physically, the Aspire V7 (model number V7-582P-74508G52tkk) weighs 2.2kg, it has a thickness of 24mm (including its little rubber feet), and it feels well built. There's no creaking or bending in its chassis, despite being so wide and comparatively thin, and the screen is held securely in place by a pair of strong hinges. It makes a nice change from all the thick 15.6in units we've seen, and Acer has omitted an optical drive in order to facilitate the thin design. It's a very good looking unit, too, with an interesting spine, in particular, and we love the dull black palm rest. There is some glossiness, in particular on the lid and also on the front of the screen. It's a touchscreen that supports 10 input points, and while it's nice to have a touchscreen these days (especially on a Windows 8 laptop), we're not sure how much use it will get from many of you. The resolution of the screen is only 1366x768, which on 15.6in screen offers large icons and text to tap on. This makes it easier to use touch than on a Full HD screen, even while you're in the Desktop environment. Additionally, Acer has the laptop display settings set to 'Medium - 125%' size, rather than 'Smaller - 100%', which further makes the Desktop easier to use with touch. The only thing is, it's not an overly comfortable experience to use touch on a screen that can't be tilted back to lie flat on a desk, or used in a tablet form factor. Your hand basically has to hover over the keyboard. It's more suited to the odd poke and swipe, rather than prolonged touch sessions, such as playing games. The hinges are strong enough to dampen the effect of tapping, so the screen won't wobble uncontrollably every time you hit it. Because it's a glossy screen, reflections will be a problem now and then, but we don't think they are as problematic on this model as they are on others that we've seen recently, such as Toshiba's Satellite P50t. The screen has a decent level of brightness that goes some way to countering reflections, its contrast is adequate for viewing photos and videos, and its vertical viewing angles aren't terrible — although we did have to change the tilt now and then depending on how we were sitting. The chassis is so wide it's easily able to house a full-sized keyboard, and one that includes a number pad. The main keyboard has keys that are large and laid out in a chiclet style with lots of room around them, but the number pad is slightly squished. We didn't have many problems typing on this keyboard for long periods of time, but we found the keys to be a little too shallow, and a little too smooth. We'd prefer a little more travel and a bit more texture on the keys. Because of the inclusion of a number pad, the main keyboard is positioned to the left of the unit and it leaves only a small space for the left-hand palm rest. This wasn't an issue for us, but we can see it being uncomfortable if you have large hands, or while typing with the notebook on your lap. The keys are a little too shallow and have a much-too-smooth finish, but it's a good keyboard overall. The touchpad could use better drivers, though. A backlight is included in the keyboard, and it lights up in a beautiful white colour. It's not an advanced implementation, though; you have to switch it on and off yourself. There is no timer, nor is there an ambient light sensor. The touchpad on the Aspire V7 is a large one (106x78mm), and while we had no problems navigating Windows 8 with it, its driver software could be better. It's an ELAN pad that has some settings hidden by default. For example, if you want to change two-finger scrolling from 'reversed' to normal operation, you must first go into the driver's 'Additional' settings and then change the configuration to 'Microsoft modern touchpad experience'. This will then display settings for the two-finger scrolling gesture that are otherwise hidden. The pad doesn't support three-finger (or even two-finger) flicks, which we sorely missed, but the pad can be configured to use three-finger taps instead. Around the edges of the Aspire V7, you get a sprinkling of useful connections. The right side has a combination headphone/microphone port, an SD card slot, and a USB 2.0 port. There is another USB 2.0 port on the left side, along with the power button. We're not fans of the power button being in this location, mainly because we accidentally pressed it a few times while moving the laptop around. We think it should either be moved to a location above the keyboard, or turned into a sliding switch that makes it harder to accidentally manipulate. 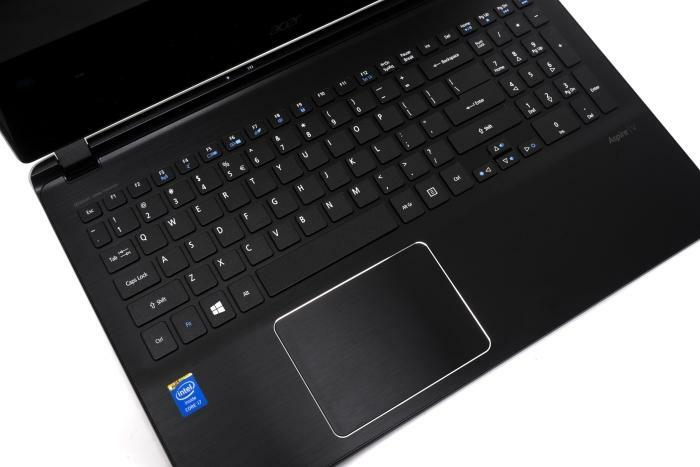 We made the same observation in our Acer Aspire R7 review, which has the power button on the right side. More ports are located on the rear of the laptop, including Gigabit Ethernet, USB 3.0, a port for a VGA dongle, and an HDMI port. We're disappointed that there is only one USB 3.0 port and that the USB ports on the sides are limited only to USB 2.0 speed. The rear also contains two air vents and the power port. We like the position of the power, HDMI and network ports at the rear, which can facilitate neat cable management when you use the V7 as a desktop replacement — just don't forget cables are plugged into it before picking it up to take it with you into the lounge. Other features of the V7 include dual-band Wi-Fi, Bluetooth, and a webcam. There's not that much on the sides. The left has a USB 2.0 port and power button. The right has the audio port, the SD card slot, and another USB 2.0 port. Like a mullet haircut, most of the business is in the back. Here you get Gigabit Ethernet, USB 3.0, HDMI, and a port that can take a VGA dongle. It's also where the power port and the air vents reside. One surprising feature that's worth pointing out is the speaker system. The sound from this notebook sounds very clear and well rounded; you even get a distinguishable low-frequency response, and a reasonable volume level. It's definitely enjoyable to listen to music through these speakers. However, they are located on the underside of the chassis, which means they will be slightly muffled if you listen while resting the notebook on your lap. The speakers are located on the underside of the unit, near the front (they are at the top corners in this image). They sound great! On the inside, the Aspire V7 makes use of a fourth generation Intel Core i7-4500U CPU, which runs at 1.8GHz and has two cores, plus Hyper-Threading. It's an ultra-low voltage (15W) CPU that's well suited to laptops with a thin chassis and it's the entry point for Intel's mobile Core i7 CPU range. The V7 doesn't have discrete graphics, which is a bit of a let-down for a 15.6in laptop, but the integrated Intel HD 4400 graphics of the CPU can do a reasonable job of processing 3D graphics for many non-taxing games. Rounding out the configuration is 8GB of DDR3 SDRAM, a 500GB hard drive, and a 32GB solid state cache. 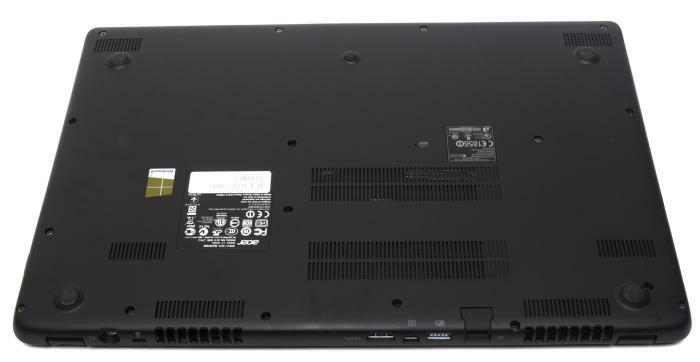 The closest comparison point in the third generation range is the Core i7-3517U, which is a 17W CPU that runs at 1.9GHz. The Acer Aspire V5 that we tested earlier this year runs that CPU, and so did laptops such as the ASUS Zenbook Prime and Dell XPS 14. In our Blender 3D rendering test, that CPU could complete our workload in 42sec. The Core i7-4500 in the V7 managed to complete it in 43sec. In our iTunes MP3 encoding test, the Aspire V7 took 50sec, which is a result we expected. The CPU manages to keep up the same pace as the previous generation CPU, but at a more efficient speed. In our HandBrake DVD-to-MP4 test, the Acer recorded 20min 29sec, which is a fair result for a four-thread CPU. A laptop with a fourth-generation, quad-core (eight-thread) Core i7 CPU can complete the same test in half the time. Basically, what you get with the Aspire V7 is a laptop that will run everyday tasks just fine, and it can also be used to encode and transcode media files quite well. Its graphics are good enough to run many games at relatively low resolution and detail levels. In the latest 3DMark, the Intel HD 4400 graphics got 46317 in the Ice Storm test, 5094 in the Cloud gate test and 662 in the Fire Strike test. For comparison, a laptop with a quad-core Core i7 CPU and a discrete GeForce 700-series adapter can get about 1300 in the Fire Strike test and 8124 in the Cloud Gate test. Storage is handled by a 500GB Seagate Momentus hard drive. It's one of Seagate's previous-generation Momentus Thin drives, rather than its brand new Laptop Ultrathin. The Momentus Thin drive is 7mm thick and spins at 5400rpm, while the newer Laptop Ultrathin is 5mm thick. In CrystalDiskMark, the Momentus Thin recorded a read rate of 121.2 megabytes per second (MBps) and a write rate of 114.7MBps. These are quite good results for a 5400rpm hard drive. A solid state drive of 32GB gives a boost to boot times (it takes less than two seconds to wake up from sleep mode), and can speed up the launching of regularly-used applications. In our battery test, in which we disable power management, enable Wi-Fi, maximise screen brightness and loop an Xvid-encoded video, the Aspire V7 lasted 6hr 48min. This is an excellent result, and one that we're glad to see from a fourth-generation Core i7 laptop. It's actually very close to the seven and a half hours that Acer claims in its spec sheet for this laptop. With lower screen brightness, you would definitely achieve that figure. Note that we tested with the keyboard backlight off (as we do for all laptops), and that leaving the backlight on will drain the power a little more quickly. Despite its big size, the Acer Aspire V7 is a very good notebook to consider if you want something that straddles the line between being portable and also a desktop replacement. It can easily be used for long periods while on the road thanks to its good battery, and it's light enough to carry around in a backpack — you just need a bag that's big enough to house its 15.6in frame. At the same time, it's big enough to serve as a desktop replacement in the home, although there are cases where you might miss an optical drive, and also wish you had a higher screen resolution. All up, we like it.